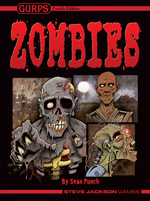 The good folks at 2 GMs, 1 Mic reviewed GURPS Zombies and found it to be . . . insanely comprehensive. Don't take my word for it, though -- I wrote the book! Hear it yourself in Episode 3-18 of their podcast (things get zombie-esque at the 00:32:33 mark). Then, if you don't have a copy yet, come back to SJ Games and order the PDF from e23 or the hardback from Warehouse 23. PS: The zombies didn't actually eat Joe and Nicky. At least, we're pretty sure they didn't.